Thomas Kinkade art has inspired wonder in the hearts of collectors around the world. As the beloved Painter of Light, Thomas Kinkade has an indisputable talent for capturing unique moments in time. 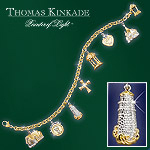 Shop dramatic Kinkade lighthouse art and luminous Kinkade village art. 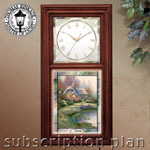 You'll treasure how Thomas Kinkade art brings to life welcoming visions of faith, home and nature. 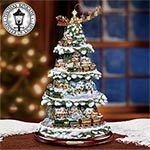 Thomas Kinkade collectibles give his vision new expression in breathtaking Thomas Kinkade jewelry gifts and soothing Thomas Kinkade music boxes. 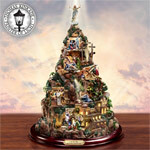 Collectibles Today is proud to present an extraordinary selection of these exclusive Thomas Kinkade collectibles, each expertly designed and crafted to showcase the inspirational beauty of Thomas Kinkade art. Shop Thomas Kinkade wall decor, a glowing Kinkade table lamp, stunning sculptural Thomas Kinkade villages and cottages and more, just waiting to become a distinctive part of your home decor! 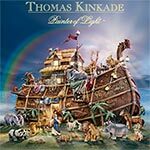 Don't wait to immerse yourself in the radiant world of Thomas Kinkade - Shop Now!